For Mimi’s birthday party last week, she really wanted to have two things involved with it, cute little pigs and every girl’s favorite treat: chocolate. So, after some negotiations, and against my better judgment, I agreed to let Mimi have a sleepover and give a chocolate making class as part of the deal. Now keep in mind that I taught myself candy making years ago using instructions found in the back of some book. I had decided that it really wasn’t for me and hadn’t done anything with my semi-skill in quite some time. Yet, for my little girl, I was willing to give it a shot. The day before the party was incredibly busy and we didn’t come home until very late. While Mimi and her best friend Angie went downstairs to hang out and do whatever it is that they do, I went into panic mode. For some reason, it is very important to my girls that I make their birthday cakes. Yet we hadn’t been home long enough that day to get a cake made. So, I found myself turning on the oven shortly after ten o’clock that night, ruing the day I’d first opened up a package of cake mix. I had to make it in two batches as I only had one pan of that size. 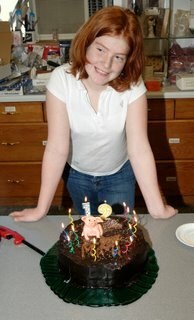 I’d also planned on sculpting a pig out of candy clay. Only, I couldn’t remember how to make the clay. So, I looked had to look that up and held my tongue very tightly against the swear words that wanted to come out when I discovered that it had to sit overnight. There really wasn’t any way around that or I would’ve found it. Accepting that there really wasn’t much I could do while everything was cooling and setting up, I went to bed. Naturally, my internal alarm clock did not wake me up as early as I wanted it too. Neither did my external alarm clock, I can be pretty good at hitting that snooze button. Somehow I finally managed to drag myself out of bed and jumpstart myself with some coffee. I started frosting and molding the cake while gathering last minute items, making a quick run to the grocery store and being sure the girls got dressed and ate. I just crossed my fingers and hoped that the cake would do. We easily found the place located in a small converted house. I knew that the owner was my kind of person when I noticed that she was running around without shoes even on the icy ground. I really knew I liked her when she, and her staff gushed over my cake…did I mention they also teach cake decorating classes there? Soon kids and adults alike were having a ball choosing which candy mold they wanted to work on. We quickly settled down and were ready to get busy making yummy chocolates. Who could imagine how much fun we would have? The next thing we knew it was time to eat and then open presents. Mimi received so many wonderful gifts, most of them involving pigs…everything from earrings to socks. It was a wonderful day for our little girl, especially as it included her two favorites, pigs and chocloate! This entry was posted in It's all about me!, Mimi. Bookmark the permalink. This saddens me greatly. I had no idea Mimi liked pigs. I think that’s great!! I just wish I stayed in better contact so that I would have found out from her instead of your blog. No offense of course. You have wonderful writing ability. Which we knew already. You should put me on your little listy thing to e-mail me when you post on here!! It’s very informative! So, when are you starting your blog??? ?